The pump for the car and the bicycle was produced because there was abolition LPG gas cylinder. It is possible to produce easily and I use it very usefully. The gas station has been seen to be similar. If the hose is not extended long in case of not being to be near the compressor, it is not possible to use it though it is possible to put some air in the bicycle and the car with a compressor. Then, compress air is put in this with abolition LPG gas cylinder, and it is possible to put some air easily by taking it to the place of the bicycle and the car. The gas of the gas cylinder is completely first pulled out, and it washes in the gas cylinder to being like water etc. it is possible to be done. The smell of LPG doesn't come off easily if it doesn't wash it many times. Completely decomposed to the next part of the valve, and attached 1/4 inch copper pipe welded. Then, the copper pipe flaring. 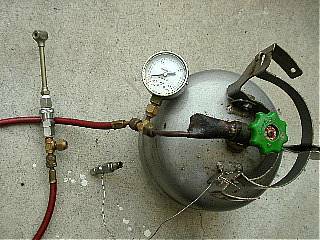 Then, attached 1.5MPa pressure gauge, hose, one push air coupler and the air adapter. It puts among the tie of the air coupler and it ties to the air compressor when putting some air in the gas cylinder. Air leaks at a dash when it makes a mistake in the order of this time of operating the valve. Water collects in the gas cylinder when using it long time. Sometimes, the gas cylinder will be made inverse and discharge the water with air. The air pressure in the tires can be measured accurately if it puts some air in the car by this. It is understood to put the air pressure of the bicycle.